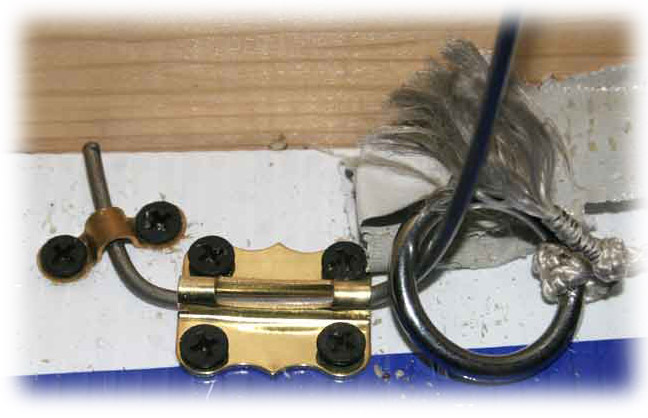 erches are one of the most important pieces of equipment for your bird. Having a perch that has a proper perching surface and is designed for the safety and comfort of your bird is crucial. However, there is no perfect perch. There's a saying in the horse world that for every type of fence, somebody has a horror story to go with it. Even the most poorly designed perches typically don't pose that level of safety hazard, but the design constraints involved must be recognized so that you can pick the best perch for you, your bird, and your situation. Eventually you will want to make modifications to improve whatever design you like, and recognizing the design aspects and constraints will help you. And it's not just the design of the perch to be considered, but the environment, the management techniques, the falconer's preferences, and the bird's behaviors. 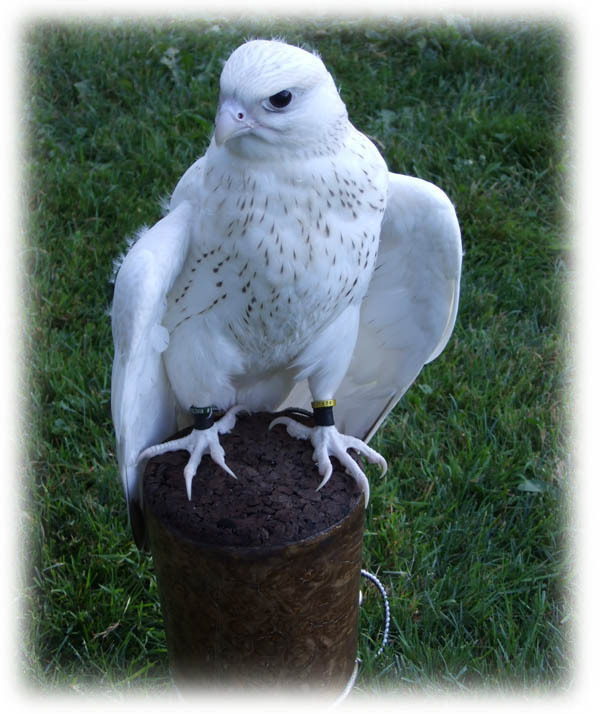 There are many things working together in a system to produce a healthy and happy bird, which is also the reason why one particular setup works fantastic for a falconer over his entire life and fails terribly for another falconer. There are a lot of tiny variables to consider that may produce success or failure, none of which should be mandated or regulated. Equipment is not a place to scrimp. Pay for good, solid equipment and take good care of it. A well-made perch can last years with proper care. And good equipment is more likely to encourage safety and health. When creating perches, think of the bird's natural environment and what they do in it. The Red-Tail has a foot structure that grips things and needs to have a perch diameter matched for that purpose. She perches in trees and on telephone poles or light posts and watches for game during the daytime. As evening falls she wants to get away and hide. Also consider that what appears ugly or distasteful to us may actually be the best design for the bird. From the outside, many who do not understand raptor needs and preferences view the vertical bars of a mews to appear like a jail or prison. This is similar to perch design. Some Fish and Wildlife officials have looked at a tire perch aghast and thought it disrespectful or damaging to a bird. What they do not understand is that the design takes into consideration their natural history, their safety, and their health. Likewise a concrete block with Astroturf over it may be the perch that a bird needs at that moment. I have heard F&W officials malign falconers who "keep their bird on concrete blocks" when that could be the best way to keep that bird at that moment. I know some excellent falconers who lovingly care for their birds, birds in their late teens, who rotate a concrete block in to allow the concrete to act as a sandpaper when the bird feaks naturally wearing the beak into shape as she would in the wild, or they will make a concrete perch by pouring concrete into a flower pot, then breaking the flower pot off to reveal the textured perch they want. 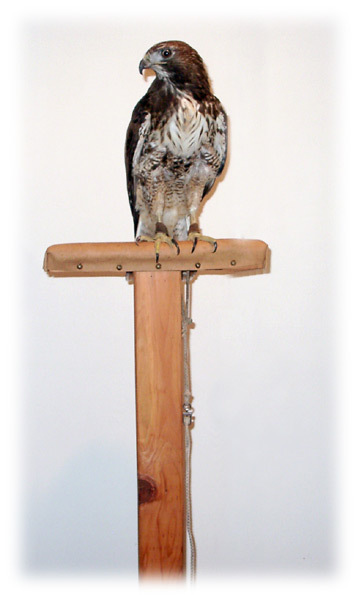 Many falconers have found that the concept of putting sandpaper on perches does not help keep talons and beak in shape, but placing a dowel rod next to a perch and wrapping the dowel rod with emery cloth or sand paper does have the desired effect, and gives the bird options as to how she wants to feak. Falconers should consider if the perch is the right perch right now, and a wide variety of equipment and approaches helps falconers meet the needs of their bird. Officials and enforcement should not assume that falconers are doing something that would damage their bird - these are our partners and our athletes and we are the most passionate about keeping our birds in good health. And those who are viewing raptor husbandry from the outside should first ask themselves, "What would be an advantage to having that equipment design?" as they view different management techniques. There are often good reasons for the designs and activities involved in raptor management, not all of which can be covered here. Many people will soak a towel in water and then wrap a perch in order to encourage the talons to slough off the external layers and become sharper. Some folks say this works miracles, and some experts say it doesn't do anything - after all birds in the wild have very sharp talons and don't get their feet soaked. At the very least it cleans off the feet, soaks the blood and dirt off, and gives a different perching surface for a while. To keep a perch clean, a 5% mixture of bleach and water (roughly 1 cup bleach to 1 gallon water) is preferred. It sterilizes, killing bacteria and mould. Be sure to follow the directions including leaving the bleach-water to sit on the surface for 15 minutes for maximum impact. Rinse this very well and allow to dry, preferably by setting it in the sun. The bleach will become completely inert quickly when treated this way. If there are oils or fats from food on the perch, the bleach will not cut through that. Use regular laundry soap like Tide to scrub the oil away or use the household cleaner Spin 'N' Span. Rinse this off well, then treat the surface with bleach. Dealing with any chemical around birds should be done carefully. Even something that we give as little thought to as a simple cleaner can burn their skin. Make sure the cleaner you are using is the safest you can get, make sure the bird is not around while you are cleaning so that she is not breathing the fumes, rinse the surface well, and allow it to dry, preferably in the sun, to neutralize all the chemistry that may be left. A well-made perch by Geoff Hirschi after 3 years of daily use. This perch has been treated well, kept in good shape, and was just re-wrapped. It has many more years in it. The blanket statement of where this starts is the breakdown between longwing falcons and other species. 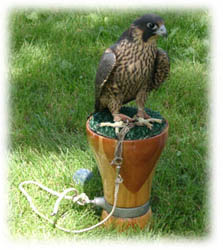 Falcons are given block perches, both for their comfort and out of tradition. Their foot structure, and their long toes, are much more comfortable on this sort of perch. All other birds are typically given anything in the general category of a bow perch. These feature a round perching surface that the entirety of the bird's toes will grip. Everything from Eagles to Red-Tails to Goshawks are found on these perches. They are handy and easy to make. There are, in practice, many other types of perches besides just these two. The perching surface itself is highly critical for healthy feet. Cleanliness is the most important aspect of the perching surface. Cleanliness from mutes as well as from chemical cleaning agents. Astroturf is a modern choice of many falconers. There are many different types, and many ways to use it. Many falconers are adamant that their long-leaf Astroturf or the "Welcome mat" type is the best material providing ease of cleaning. The "tall cupcake" type of welcome mat that is strongly discouraged. But, for as many proponents of Astroturf there are opponents. Some believe that it is too rough and sharp for the bottom of a bird's feet and the "tall cupcake" formations of grass induces problems in their particular bird. Others have lingering doubts that it really is an inert substance and could be a chemical irritant to the bird. Nylon rope is another debate. Many see the benefits that it is easy to clean and does not harbor bacterial growths as it's strengths. Others argue that it is too smooth of a perching surface and will encourage Bumblefoot. Most will agree that the healthiest materials for the bird's feet are natural materials - bark, sisal, hemp, cocoa mat, cork and other such materials have enough "give" in them to not bruise the foot even if she lands hard on the perch, yet they are stable, safe, and comfortable. Sisal should be noted carefully and preferably purchased as a product of the USA as foreign made sisal may have formaldehyde as a preservative. A cork topped block perch. Bare wood dowel, metal, duct tape and other such surfaces are usually not acceptable materials. Bare metal, even just to the side of a sisal wrapped area, can become very cold in cold weather causing frostbite or other damage to a raptor's feet. The ring that the leash will attach to should not be too thin as this will encourage the leash to lock around it. A carabeener should never be used as a ring as it will come loose, unlock, and become a danger. A large oversized ring will generally show the fewest problems, although that depends on the perch design. The leash length and weight must be scaled to the size of the bird and the size of the perch. The placement of a perch matters greatly. A perch that is close to a solid wall will generally encourage a bird to face the other direction or only bate towards the open, however some birds will try to bate at the wall or collide with it. Taking advantage of this can help direct mutes and ensure the bird is comfortable. Raptors, particularly passage birds, strongly prefer to be at eye level. Have an elevated perch setup can make for a much more comfortable and well-manned bird less likely to bate or react when approached. The surface under the perch is also of interest for this topic. The bird will bate from the perch and, if frequent, can end up with a trench dug around the perch. It has happened to many that a bate from this dug-in position has been at the wrong angle and the wrong time to have broken a leg. Many take precautions around this ensuring the diet is such to prevent weak bones. Another way to prevent the trench and reduce the traction the bird can get is by using padded Astroturf. This is not available at stores, but rather at driving ranges. It is a 4'x4' square of Astroturf (the stadium kind) laid on a thick rubber padding. If the bird bates onto this, the feet are not bruised, the talons do not collect dirt, and she cannot get enough traction to then bate away at a high speed risking injury. Deep dry sand (wet sand will freeze in some climates) stays loose and will encourage the talons to stay sharp. It is soft on the feet, although can present a problem if the bird is fed on this as she could develop an impaction. Pea gravel, dirt, grass, moss, and other surfaces are also great surfaces under the bird's perch. Again, natural materials are preferred for her, but there are some interesting alternatives. One advantage of many perches is that they are light weight and, therefore, easy to carry around. This also means that they are relatively easy for the bird to move, especially on a smooth surface. If your bird can move a perch, consider adding a spike to secure the perch to a single location. If you are weathering more than one bird near each other, this is absolutely necessary. Birds have been known to even reach through double mesh barriers an lethally injure each other. Most falconry meet weathering yards will require a spike of some sort to secure the perch to a location. For your bird's safety and for the safety of other birds, secure your perch when more than one bird is present. Securing a perch into the ground. The leash and swivel are also important to this discussion. The leash must be a proper length when the bird is on the perch so as she may bate to the ground with enough leash to walk, but short enough to not get tangled. The area within the bird's reach must be free from hazards that she could become entangled in or strike. The swivel must hang such that when she is on the perch the swivel hangs freely and is not touching the ground. If it is touching the ground it will not function properly. Accidents will happen here - the swivel can get tossed between her legs and trapped between her jesses as she turns, a rock can get caught in the mechanism, etc. Just be aware of what is going on with your bird. The movements that these birds make are frequent and many times small such that a leash can easily get wound up before there would be enough tension on it to spin the swivel around straight. Bating does have the function of straightening out the leash, swivel, and any spinning or rotating mechanisms. Adding a second swivel to the entire lineup (such that from the perch to the bird's leg it goes perch - swivel - leash - swivel - jesses) will further prevent this from happening. Using high quality swivels will similarly help prevent it, and the lighter weight Titanium swivels will not carry as much momentum when a bird jumps back to her perch to flip back between her legs. An example of a leash and knot out of proportion with the swivel. The knot is not in line with the swivel and entirely too big for this setup. 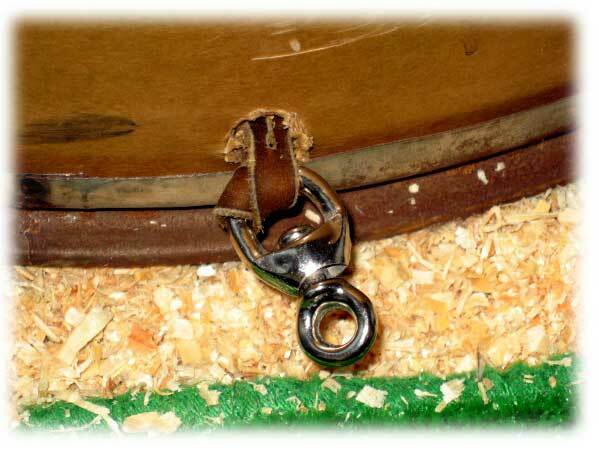 Notice the way these leather jesses are riding too high on the swivel's U - this can lead to the swivel mechanism being held in place preventing it from swiveling. Block perches can be incredible works of art made of marble, cast of plaster, turned from wood, or they can be very simple. As long as it is safe and comfortable, it will serve its purpose. There are a few main styles of blocks. The Arab style block typically features a flat platform supported by a narrow body. The English style block typically is one solid piece with a flat platform tapering slightly to a very wide body. There are many other styles that have developed taking various features and materials, but these are the most traditional. A simple block perch can be made by forming concrete in a flower pot. Smooth pebbles can be pressed into the surface to create an uneven surface for the bird's feet to perch on. One note on the spikes, either for a bow or block perch is that if you are in rocky soil, these can be terrible pains to get seated well and deep into the ground. A perch with feet or another standing surface can be used anywhere. Many of the blocks have a body that is tapered or narrower than the top. The advantage of this is that mutes won't smear down the sides as easily and the block will stay clean. This doesn't mean that narrower is better as any amount of tapering will give this feature. Some blocks have perfectly flat tops. Many falconers will seat these at a very slight angle. The advantage of this is that mutes will not sit on top where the bird will step in it, they will instead run off and out of the way. 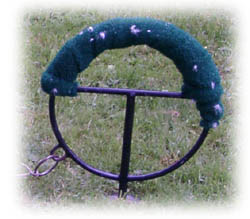 The one design warning of block perches is that the leash will tend to wrap around the perch and lock in place. Wider neck block perches that continue all the way to the ground will tend to do this far less than a narrow necked perch. And a perch that has the ring on a wide band that encircles the perch will also reduce this risk. The shorter the block perch is, the safer it is. There are fewer complications with a perch that just raises the bird up enough for the tail to not drag on the ground than with a perch which elevates the bird higher. Arab style blocks tend to be taller, but the Arab style falconry tends to have somebody watching these birds at all times. Shorter blocks may not look as stunning, but they will prove safer over time. Another warning is with the jesses - if they are too long then the bird can end up straddling the perch and become entangled. A wide block top, and shortened jesses, will reduce the chance of this happening. This English style of block perch is one of the safest. Even with this great design, the potential for a leash to wrap and catch around the perch still exists. Even the best equipment has a potential problem. A sampling of several different types of suitable block perches - the block on the far right is a good example of an Arab style block. The basic bow perch is just that - a bow of metal or wood with a perching surface where the bird will stand. These can be made in all different sizes. With a bow perch, the diameter of the perch is of consequence. A bow that is too small in diameter will allow the bird's talons to hit the skin on the opposite side of the foot, possibly causing damage. A bow too wide in diameter is uncomfortable. It is best to provide several different diameters for your bird by giving her several perches as that will ensure that the whole bottom of the foot is treated properly. 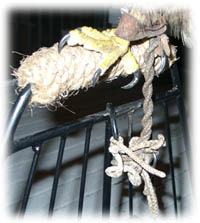 These perches are typically wrapped with rope. The perching area can be padded with foam pipe insulation or strips of cloth under the rope, although that is not necessary. Birds who tend to slam hard into a perch may be better served with a perch that gives slightly, like a swinging perch, as the padding needs to be wrapped tightly enough so it doesn't move often reducing the padding effect to nearly negligible. A note on the bow perches similar to the block perches. These can also have spikes or feet or similar stabilizing surface. 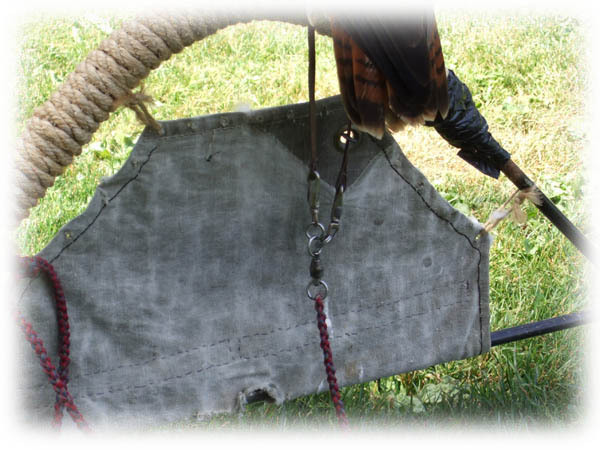 Feet are more typical on the bow perch making it easily portable. The feet need to be heavy enough to keep the perch from being moved or tipped over if the bird bates. They also must be constructed such that the leash does not tangle or catch. If the sides are too steep, the ring will not be able to travel from one end to the other and will end up staying on one side allowing the leash to tangle. And since the ring must travel from one side to the other, there cannot be any impediments. The transition from the bow to the wrapped area must be smooth to prevent the ring from catching on the bumps. The open area below the bow must be small enough that the bird is not able to walk through it. 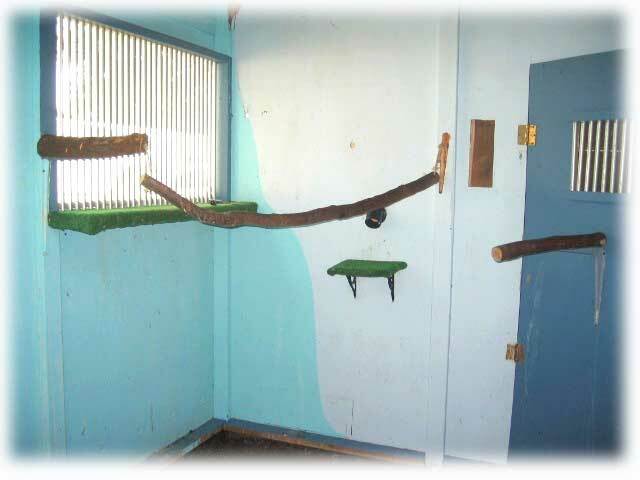 This can be done through a low rise to the perch or otherwise block the underside with something. This is a bow perch of quite nice design. Note the slope of the bow's curve. The low rise to this will better allow for the ring to travel the length of the bow and prevent a bird from walking underneath it. The rope transitions smoothly from the bow to the perching surface and back, so the ring will be less likely to catch on there. The ring is large enough so as not to be at an angle that would get caught. And finally, perhaps most importantly, are the two pieces attached inside the curve of the bow. These prevent the ring from going all the way down on either side of the bow. One of the most common ways that a ring gets captured on a bow perch is when the ring is laying flat on one end of the perch and the bird bates in the opposite direction. The direction of the force and the angle of it prevent the ring from traveling anywhere. These two pieces help the ring to stay mobile and not be trapped. One thing to note, though, is that the base is very light weight. A large bird bating would pull this over on herself. This perch should be used as a jump-up perch or otherwise be anchored. There are holes drilled in it to let this be affixed to a plywood platform or have stakes driven through it into the ground. A bird that has gotten hung up due to the scale of the perch and the ability to pass under the bow. A perch with a bird that tends to walk through it can also be altered to prevent this. However modifications need to consider how the leash will travel with the modification in place. Another way to modify a bow perch to prevent the leash from tangling and the bird from passing under the perch. This is a bow perch of quite nice design scaled for a Kestrel. A block perch of quite nice design scaled for a Kestrel. 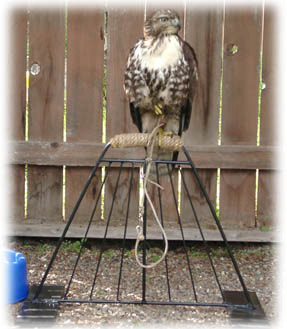 A tabletop block perch designed for a Merlin. Also called a Rotating Ring Perch, these are sometimes maligned as having too many moving parts. They are compact and stable as they have a single spike that typically goes into the ground. However, it is possible for the leash to get wrapped around this spike. This example shows how the center of this ring perch is blocked from a bird who may try to walk through it - an excellent safety feature. A ring perch (above) and a small ring perch for microhawks (to the right). Notice how the small ring perch is designed to be a tabletop fixture and has a plant tray filled with unscented clay cat litter to catch the mutes. 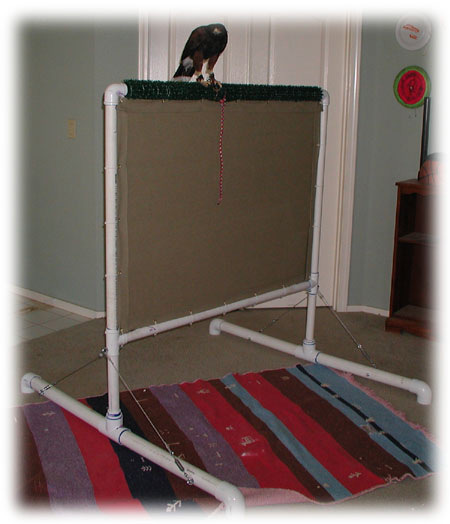 The bird would never be left alone in a setup like this, but it makes a great way to have the smaller hawks indoors and with you. These are favorites of some and hated by others. These are excellent perches in the right hands, and disasters if used incorrectly. A newly trapped bird will also have difficulty with the physics of her new situation and is not recommended to be placed immediately on a screen perch. Any bird that has not been introduced to a screen perch must be watched carefully to insure its safety. A bird who does not understand the screen perch or has a poorly designed one can damage her feathers, or even injure herself. One of the biggest advantages of this design is that it can be placed up off the ground. These birds naturally want to get up high and hide come evening and having a screen perch allows you to accommodate that need. 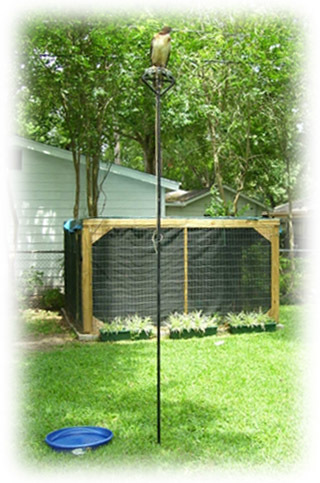 A screen perch also gets a bird off the ground and away from mould or dirt or cold, moist air that stays near the ground. When you approach the bird, she will be at shoulder or eye level instead of having you towering over her. Some believe that because of these aspects it reduces the physical and emotional stresses on the bird. The most immediate issue with a screen perch (or shelf or table perch) is that if a bird is able to bate off the end, she could find herself hanging and without a way to recover her perch. This can be because a leash is just a little too long and tying it an exact length is a necessity. Anything that will cause a bird to bate must not be present - windows near a screen perch will only invite a bird to bate towards them. Many falconers only use their screen perch when the bird is hooded, such as when they are asleep for the night. The leash must be tied short, and the bird must be in good health and not overly nervous of flighty. Canvas or duck cloth makes a great material for this, but must be very taut. As with any perch positioned near a wall, care must be taken to prevent bending the tail feathers against the wall which would damage or break them. A screen perch with two Harris' Hawks perched comfortably. Photo courtesy of Richard and Becky Brunotte. Designed by Heinz Meng, this is really an altered bow perch with safety enhancements. It is sometimes called a Tail-Saver Perch. This perch is marked by a narrow perching surface at the top (roughly 9" across on this one) and a wide base (roughly 24" between the rays at the widest points) with vertical rays (the outermost rays are roughly 20" long) to prevent the bird from passing under the perch and tangling. The perch is 20" high. The ring to attach a leash to is at the top as well. This counter-intuitive design actually allows the bird's bating to be against a high point thus literally pulling her feet out from under her and preventing her from getting a bate at an angle that would put enough stress on a leg to break it. The high attachment also means that when the bird bates and is pulled off-center, the tail does not get bent. The leash length should create roughly a 45° angle when the leash is fully extended. In fact, the leash will pass through the bird's tail. For this reason it is important that the swivel be located at a distance that it not pass through the tail. This is easiest to achieve with a jess extender. Because of the high tie-off point, be careful not to build this perch too tall else it can tip over. Heavy feet with long enough bases will help prevent this. Since the ring does not travel the length of the perch, there is no concern of the ring being trapped. A Meng perch made by Geoff Hirschi. 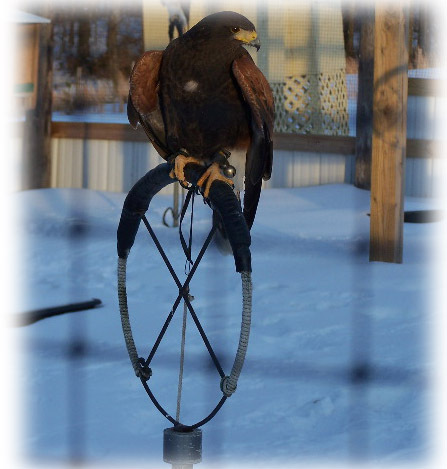 Although according some formal falconry tests, tires are not acceptable perches, these actually make excellent, safe perches and should be available to any falconer for long or short term use. Because of the misunderstanding of this piece of equipment by regulators, this section has been updated. 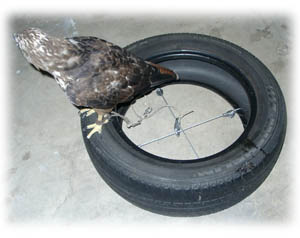 The tire surface can be modified or shaped for a bird's particular movement or morphology. These are exceedingly safe, especially for freshly trapped birds. There is nothing for the leash to be wound around, nothing for the bird to entangle on, the bird has no chance of hanging, and the bird has freedom of movement. These perches may appear like the falconer is making a perch on the cheap and at the expense of the bird. On the contrary, for those of us who use them, the perch has been chosen for safety. If there is concern about the heat absorbed by the tire or the temperature of it, the birds will hop to the ground if the tire heats up also indicating that the bird needs to be in the shade, and the tire can be painted with a white latex paint for very sunny, hot climates. This perch is not an unattractive piece of junk, it is rather a perch specifically chosen for the bird's well being. 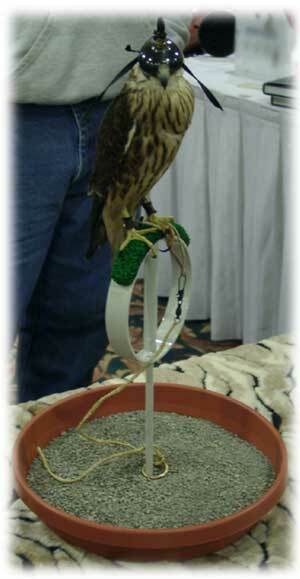 Long time falconer, biologist, and trainer Steve Layman has this to say about tire perches, "I've been using these perches since the late-1960's and have experimented with a variety of surfaces such as adding sisal or Astroturf, but have found the tire surface itself to be the most optimal. In fact, when several surfaces are presented on the same tire, the birds frequently chose the bare tire to perch on. 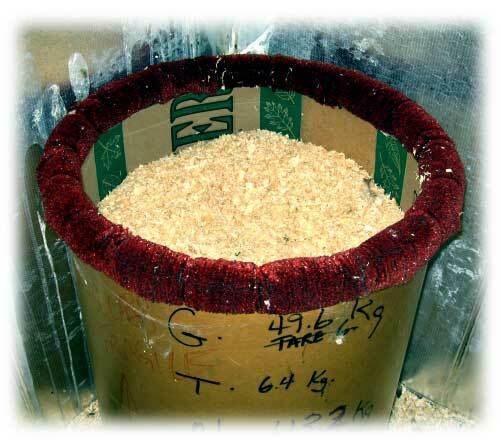 The surface can be easily sterilized when necessary, the birds are kept safe, and can nest or cache food in the center. Aesthetically these may not be pleasing to some, however I much prefer them over the block perch - in fact, I don't even own a block perch now. For my hawks, I use Meng perches and tire perches starting their training on tire perches and switching to Meng perches to be able to direct their mutes. Large airplane tires [or other large treadless tires] make great perches for eagles. In my opinion they are probably the safest perch there is." 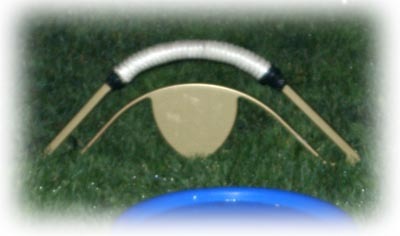 The basic design is a circular perch around a single point where the leash is attached. This could be made out of any material, but a tire is easy and can be found in a variety of sizes. A note here is that some very strong birds can bate and pull a tire across a smooth surface such as Astroturf. Concrete or plaster of Paris can be poured into the bottom of the tire to add weight and prevent it from being pulled. If nothing is poured in, it's possible for water to collect in this area and therefore breed mosquitoes. Drilling holes in the bottom or removing the bottom lip will prevent water, feathers, or mutes from being held here. This is also an ideal perch for a ground nesting bird such as a Snowy Owl. I is low and flat and similar to the type of nesting structure they are most attuned to, particularly if the tire structure is painted white. Another similar perch is an old tractor disk that has worn down significantly. It is about knee height and can be set in a flower pot base and covered in Astroturf. This is the same concept and similarly is very comfortable for a Snowy Owl. The T-Perch is unsafe for a leashed bird as the leash can get can get caught on one of the T pieces, the jesses can straddle a piece, or the bird can generally get tangled, but this can be a favored spot of a free-lofted bird. It can be placed high up giving the bird the location she wants, and it can "give" slightly as well. 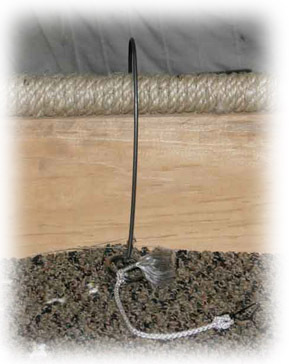 A tall T-perch can be placed in a mews and made of 1/2" rebar with a piece of tubing across as the top T perch surface. The height of the T allows it to give slightly so even a bird that hits a perch hard will not hit this too hard. The basic design is a tall perch putting the bird at eye or shoulder height. 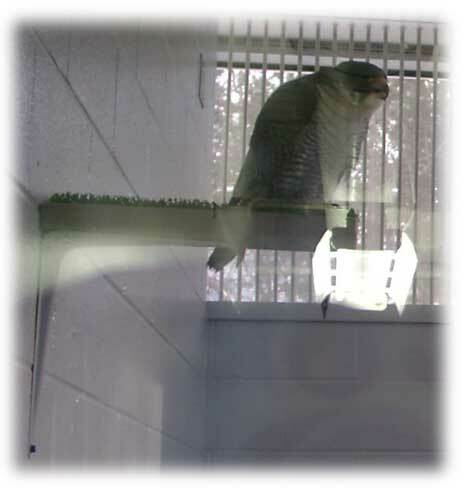 This particular perch is about 5' tall and is used for remote control jump-ups or general inspection or talon care. In a mews these can be built up very high to allow a bird a preferred position. If the bird is not tethered, then a rope perch or a tree branch up high in the mews makes a great interactive perch for the bird. 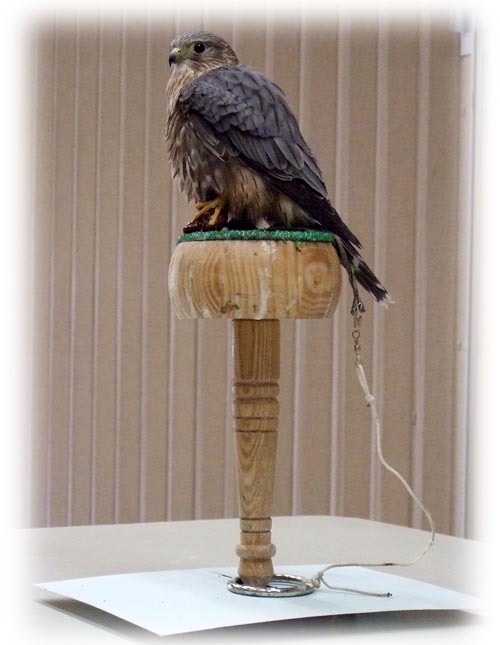 A rope perch has movement and a perching surface that "gives" when the bird lands. If you are using a used rope, such as one which has been used to tie freighters or ferries, be sure to soak it well in soapy water before allowing your bird onto it. With a natural branch, consider cutting off all sub-branches even with the bark so that the bird doesn't cut a foot on anything sharp. As the bird uses the perch, the branch may need to be rotated or exchanged for a new perch as the bark wears down and becomes smooth. Other materials for a swinging perch might be a length of 1" PVC pipe filled with sand and wrapped with sisal or other perch material. The added weight of the sand in the pipe will allow it to sway without there being too much free movement. Besides the interactive nature of the rope perch, the rope perch is a good material for the bird's feet giving enough softness to prevent bruising and enough abrasion to keep the feet in good condition. Rope of natural materials or marine ropes are far preferred over nylon or other synthetics. With a rope perch such as these pictured, it is near impossible for a bird to injure herself in any way. She has a choice of perching areas, can escape up into the corners of her mews or can sit in front of the window. 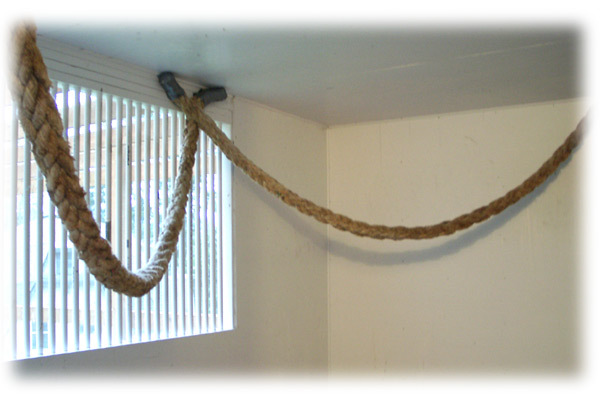 Two rope perches in a mews, each of 2.5" to 3" diameter hawser rope. Just as the name indicates, this is a shelf coming out from a wall. Typically wrapped in sisal or covered in Astroturf, the bird can choose where to stand on this perch. One problem with this is that the perch allows the bird to stand close to the wall - and in doing so, to rub feathers against the wall. This can cause damage. Some birds are more prone to this than others, but a good way to use this is to alter the connection with the wall, or structure the perch in a way that discourages the bird from rubbing and damaging feathers. Shelf perches are also blamed for many toe problems. This may be solved by using varied surface such as rocks and pebbles or by routing 1/4" grooves through the surface. 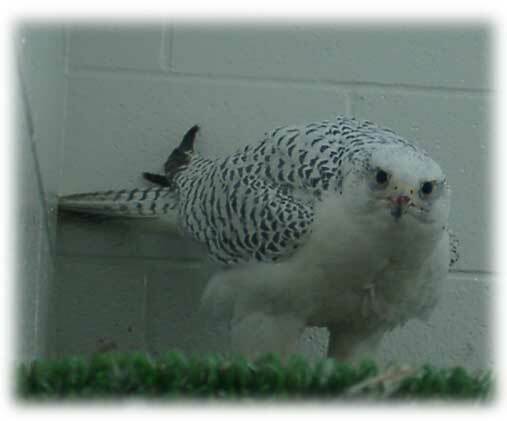 This Gyrfalcon is illustrating how the feathers can get damaged, bent, or broken with a shelf perch. This Peregrine is on a perch that encourages him to stand perpendicular to it. Although he can turn around and catch feathers on the Astroturf, the perch style lessens the potential for this. 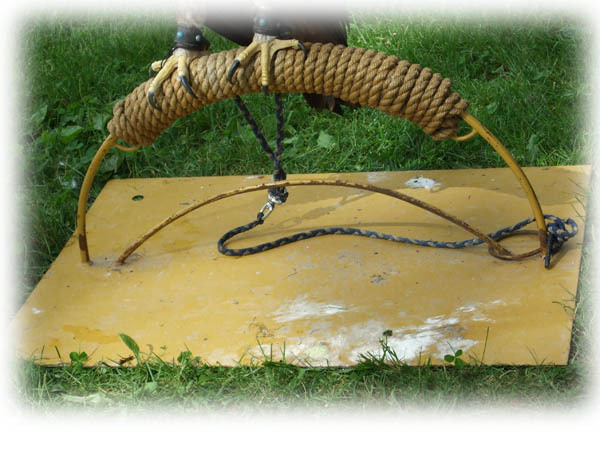 If a wide gauge rope perch is not available, the same results can be achieved with a swinging perch. Take a length of 1.25" dowel about 2' - 4' long and wrap well with sisal rope. Suspend it about 2' or 3' from the ceiling. However, make sure that this is anchored to the walls and not with lengths of rope to the ceiling. A corner is a great place for a swinging perch as it's high up and inviting there, and the two corners provide sites for attachment. The reason for this is to prevent the bird's feathers from rubbing against the ties. 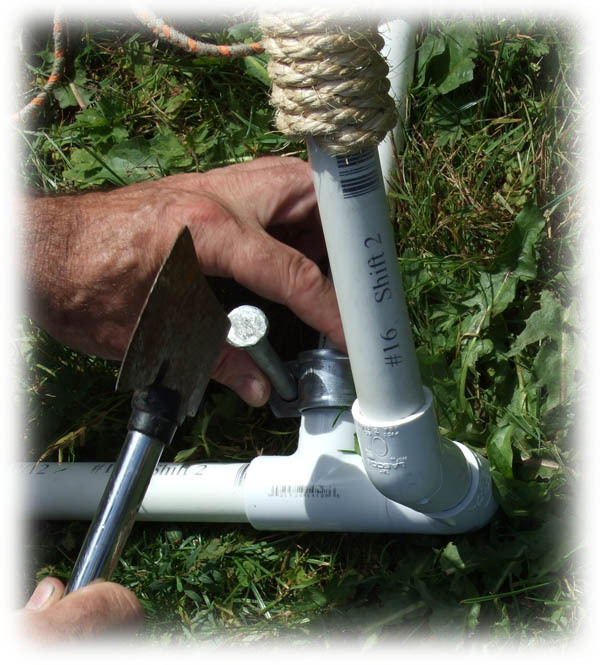 A simple eye screw in the end of the dowel and a short length of rope, wire, or chain will suffice. Just make sure it is a very short distance or only an inch or so. 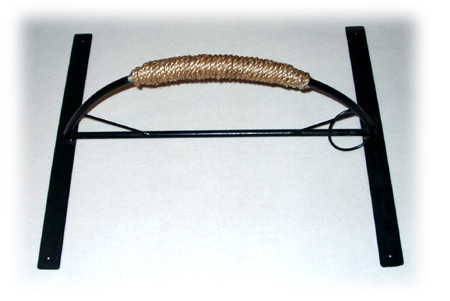 A swinging perch can also be made out of a branch. Soft barked tree branches such as willow or elm make the best natural bark perches as they have an uneven surface, but enough give in them in case a bird lands hard. Branches can be fitted into the mews and secured with shelf brackets to the walls of the mews. You can even do a combination with a branch fitted with an eye screw at each end then attached to two walls with lengths of rope. With any of these, be aware of the bird's flight movements so that the bird will not strike anything. A limb the diameter of your wrist can be attached with rope, chain, wire, or anything else, and can be set up so that only one side moves. Swinging perch in a mews corner. Photo courtesy of Richard Brunotte. This design is basically the Circumscribe Perch, only raised. The benefit of the depression in the middle of either perch is that a bird can nest in it. In this barrel design, the center has been filled with Spruce shavings. Although this may not be a good management technique for all birds or all situations, it works well for this bird. The barrel is 22" across and 28" deep. It is filled with spruce shavings to a level that allows her tail to clear it when she perches facing outwards. The shavings are easy to scoop if she slices into them. The rim upholstery is a crushed astro-turf like outdoor carpeting layered over a pipe insulating foam cover. It is cleaned with a cloth, nail brush, soapy water and allowed to air dry. The leash system uses a jess extender, and is of the loop leash type, so there is no knot up at the extender level to run through the tail feathers. The leash attaches at floor level with enough slack so that she can gain the perch and nap in the basin part of it. The leash is relatively long (length of barrel height plus jesses and extender). This bird also collects her toys from the floor and drops them in the basin. The bird is kept on a loop leash system. The bewit pictured above is attached to a large diameter ring through the wall of the barrel. The Round Perch is sometimes called the Waller Safety Perch. 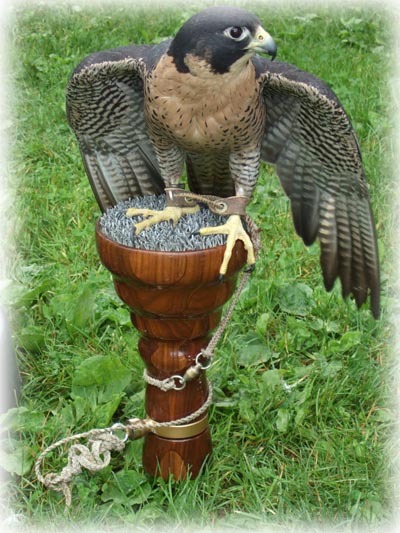 It is primarily used for falcons and can be modified many different ways. Round perch in a mews corner. Design, details, and photo courtesy of Jo Turley. 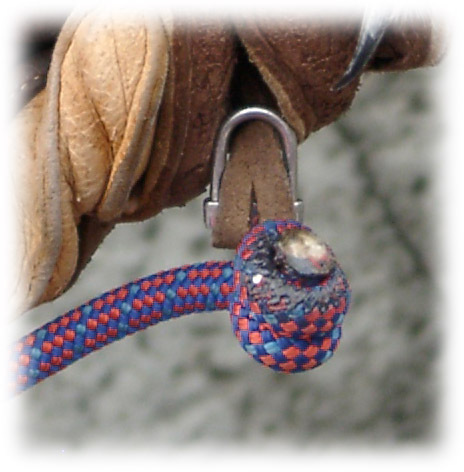 Round perch leash attachment detail. Round perch perching surface and nesting area. Similar to the round perch, indeed nearly identical in features, this is more of a modification of the sizes and ratios of the dimensions. Here the tall pole perch is 6" diameter across the perching surface and 48" high - well suited for the Merlin perched on it. Pole perch with a Merlin. Photo courtesy of Dion Thomson. Photo courtesy of Charles Redding. Named for Floyd Presley, this is sometimes called a high perch or tall perch. 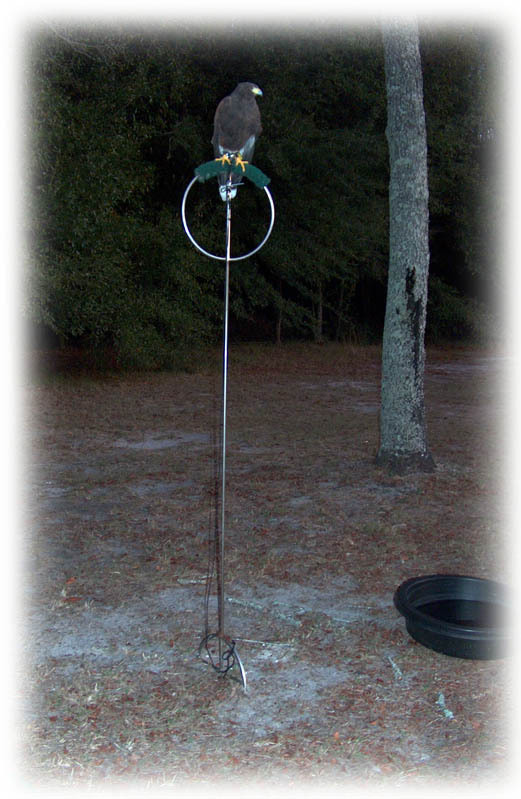 This is basically a rotating ring perch elevated up in the air, anywhere from 5 feet high to 20 feet high appropriately scaled for the bird it is being used with. The advantage of this perch is that the bird enjoys the elevated perch and must use her muscles to gain a stance on the perch, however the danger is that if she is tethered to the perch and bates directly over the top she could catch the leash and hang herself there. The leash must be the proper length for this - too long or too short and the bird will end up tangling it. The leash is attached to a ring that slides freely up and down the post. The ring will hang off the leash when the bird is on the perch. When the bird bates she will end up on the ground as will the ring. As with any rotating ring perch, the bird must not be able to go through the center of the ring else she risks hanging herself. Photo courtesy of Jason Caldwell. Photo courtesy of Karen "Kitty" Carroll. This perch has a long perching surface running perpendicular to the loop that holds the leash ring. 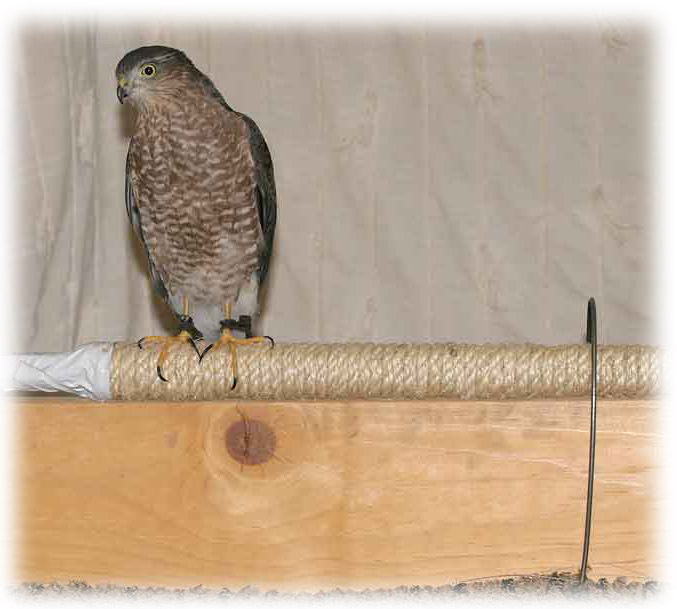 The perch shown below was used for a Sharp-Shinned Hawk. Wingspan is estimated at 3' - 4', and the perching surface is appropriately scaled to 39" long. It is reported to keep the feathers in great condition and can be scaled up for a Goshawk or other bird. Another version of this uses a length of 1/4" twisted nylon rope instead of the metal guide. A 1/2" hole is drilled in the center of the perch just above the bottom edge. The rope is passed through the hole and a metal ring is put onto the rope for the leash to be tied to. The rope is spliced together so that it makes an unbroken circle. The leash is rather short, then, sized for the perch and bird. Loop perch with Sharp-Shinned Hawk. Photo courtesy of Natasha Leong. Loop perch in its entirety. Notice how portable this is. With the proper leash length, there is almost no potential for tangling. Loop perch detail of the ring and pole that it rides along. Loop perch detail of the pole attachment. As with many designs, an aspect is simply elongated or distorted in some way to evolve a new design. I was particularly tickled on seeing this perch as it is portable, yet gives options. It's a short trolley, or a double bow. Two separate perching surfaces could be set up on either end to provide even more options. The falconer shared that he simply popped the PVC pipe into the oven at 200° - 300° for about 5 min or until it was able to be bent. He then bent it to shape and it cooled hard. I would suggest checking the safety of this material heating up before trying that, and certainly would only do it in a ventilated area with birds, animals, people nowhere in the structure. Although not a permanent perch, this allows a bird to keep quite cool in hot weather. 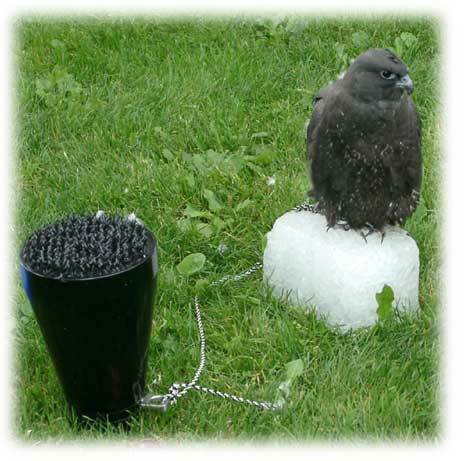 Since birds use the heat exchange of their feet to regulate their temperature, the ice block is a great solution to help regulate a bird's temperature and keep her comfortable in heat. Blocks of ice can be purchased from the grocery or many gas stations, or could be made at home by freezing water in a plastic flower pot. Let the ice melt slightly before introducing it to the bird, and allow the bird choice in perching surfaces. With the ice block melting, corners will round and a leash is very unlikely to catch. Young Gyrfalcon enjoying an ice block in 100°F heat. For proper management of our bird's feet, we need to provide a variety of perching surfaces and widths. 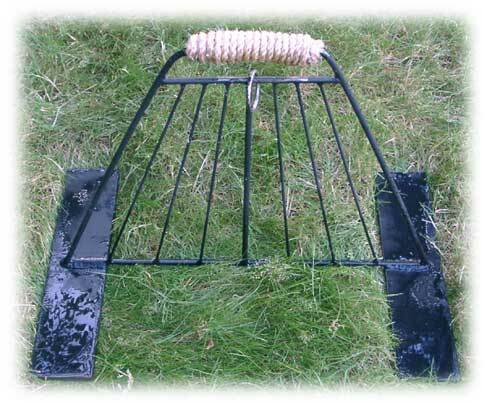 One way to ensure your bird is using a variety of surfaces is to swap the covering on the perches. A simple sisal perch can be made fairly narrow, then cocoa mat or Astroturf can be laid over this in a non-permanent way. 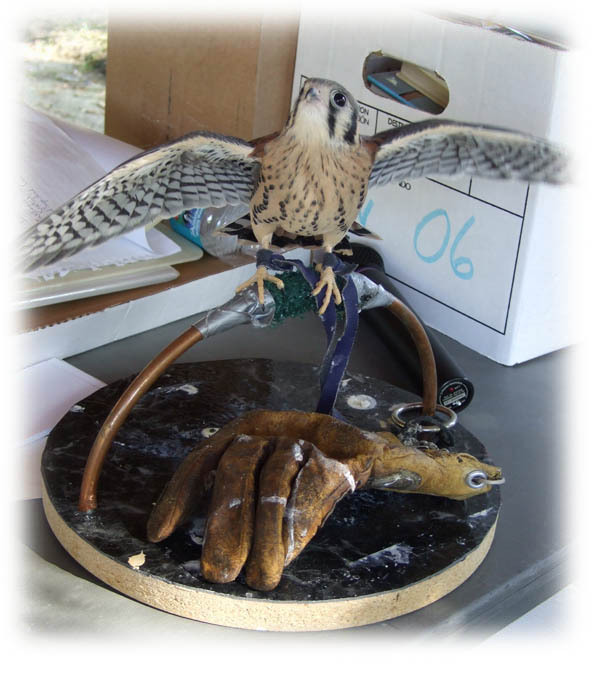 This allows the falconer to swap out the perching surface on a very regular basis - even weekly. Here the cover has holes punched to weave cable ties through. This ensures the perch covering is attached securely (preventing it from slipping or rotating) and that the bird cannot catch a toe under the cable tie. Some of the fibers have been cut away to allow the cable tie to lay in a channel further reducing the chance of any problems. A note about Astroturf is that there are many different kinds of Astroturf. I have heard some excellent raptor vets malign the long leaf Astroturf - the kind where the individual blades of green are long, straight and sharp. The observation is that they see many birds come in with Bumblefoot who were kept on this, and the theory is that that sharp blade of Astroturf is actually aggravating the foot skin, and possibly the chemistry of the Astroturf is a problem. This isn't a direct cause and effect, but something to be aware of and consider if you are encountering a problem. Cocoa mat covering a sisal perch. This can be swapped for Astroturf or a number of other surfaces very easily, or can be removed and allow the bird to just use the sisal perch. This varies both the surface and the diameter of the perch. The Mailbox Perch is basically a round log about 2' long and about 12" in diameter split in half so that it's semi-circular. It is set just within tether range of a perch and the bird has the option to hop to it and stand on the bark. It should be pointing straight to and away from the perch - like a hand on a clock to allow the bird to stand on the surface without catching the leash on it. 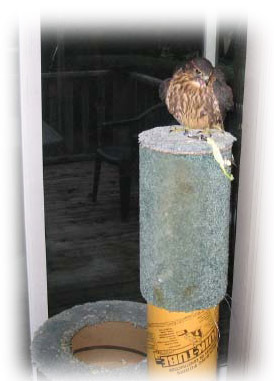 Heated perches may be useful to some species and in some climates. A product called Thermo Perch has been created for exactly this purpose. 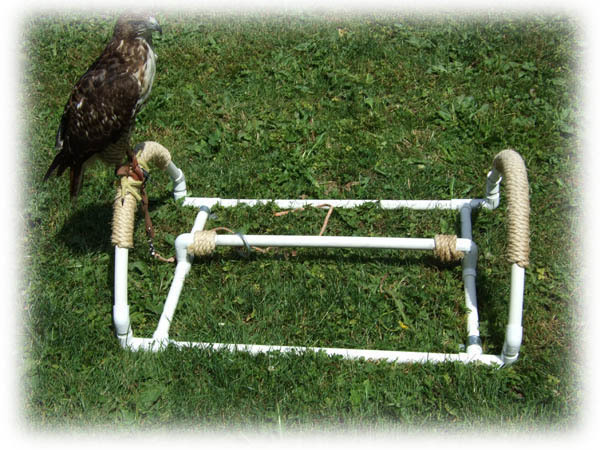 Many falconers and rehabilitators use a product called DampChasers selecting various sizes for different sized birds. These can be mounted with a perch, covered with Daisy Mat or Astroturf, or a thin sheet or towel then cable tied to a perch. 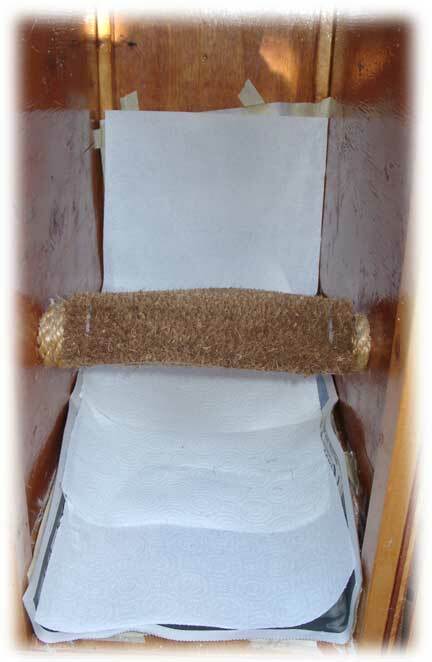 A shelf perch can have two DampChaser storage dehumidifier rods laid over it and covered with a towel and then pea gravel which allows the stones to also heat up and radiate a small amount of heat to the bird. 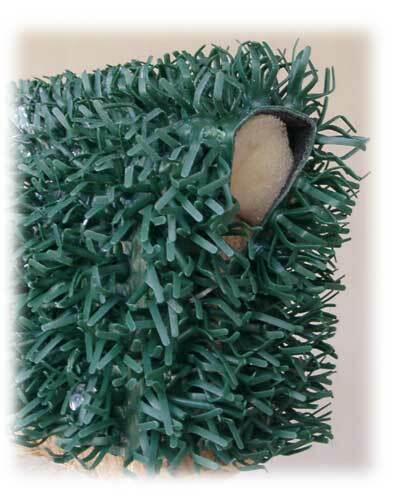 DampChasers can be placed inside a three foot section of 3/4" PVC pipe with many 1/4" holes drilled into it for air circulation, then wrapped in either Astroturf or sisal across half of the diameter. They are enough voltage to stay warm, but still a very low voltage. They can also be plugged into a thermostat temperature control that will only turn it on when the temperature in the mews drops below a certain point. There is also a product called ThermoPerch made specifically for bird perches. Heat tape can burn a bird's foot if it is not used correctly. 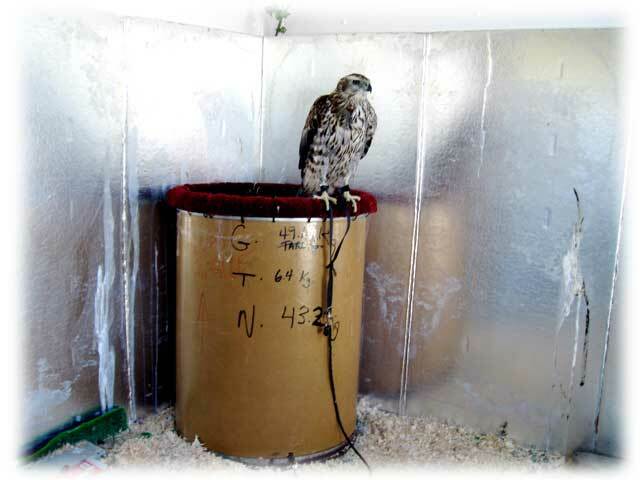 Some falconers in particularly cold climates have a small electric heater placed below the perch or a lightbulb such as those commonly placed in chicken coops. Any power cords should be protected to ensure birds cannot bite or puncture them. The Paddle Perch basically looks like a canoe paddle standing on end such that the wide part that would be in the water is instead up in the air for the bird to perch on. The advantage of this over the T-perch is that it is perfectly smooth without a way for jesses to get caught. 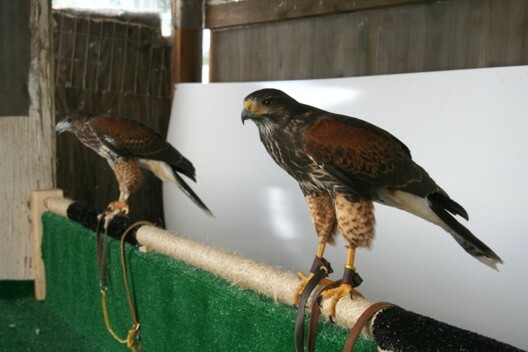 To perch many birds, some falconers use a 2"x4" length mounted horizontally. This is an excellent solution to the problem of how to perch birds in an organized fashion, but caution should be taken. File down the edges or otherwise round them out to prevent the bird's foot from cracking where the corner is. Wood with angles such as on a 2"x4" should be avoided for long term perching use as this can tend to cause problems. In a free-loft setting, having perches in a variety of locations can allow her to hide and feel safe or watch the goings on outside. 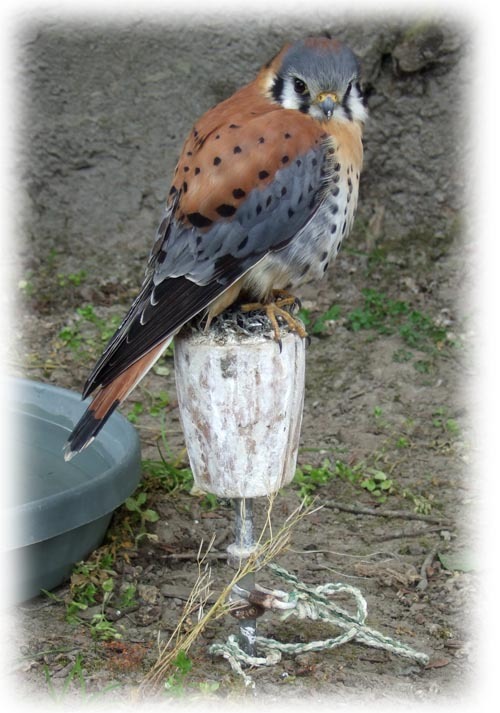 In these settings, falconers frequently provide other sorts of accommodations, such as a concrete or wood cubby area for a Kestrel as Kestrels are cavity nesters and she may prefer that option for nesting or sleeping. Carpet, particularly loop carpet is viewed by most to be unsuitable. The material tends to hold moisture and grow things, the loops can trap a toe or talon and even break it, and the carpet itself will polish a bird's foot wearing down the skin and scales away.